Who doesn't like having a plate of jewel-colored food set in front of you? At about 1pm there is nothing I like better than a plate of vibrant greens contrasted with bright pops of color. 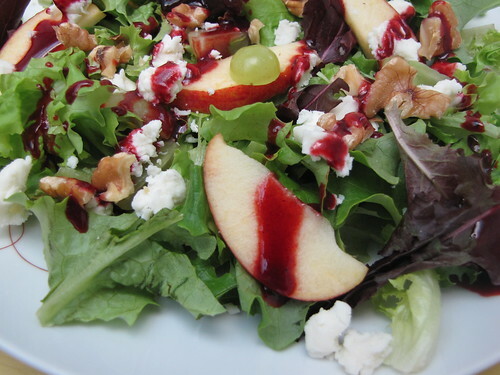 Just like this berry vinaigrette gives you. It's food for your eyes and good for your body. It's lightly sweet. But with a nice cut of acid through it from the balsamic. Use it on apples, pears, berries, grapes, corn or avocado. The possibilities are many! In a food processor, puree the berries with the sugar and let sit for ten minutes. After ten minutes, add the remaining ingredients. Taste, and adjust ingredients to your liking. Store in the fridge in a lovely glass bottle. The olive oil may become viscous in the fridge, so when ready to use, allow to sit at room temp until liquid again. 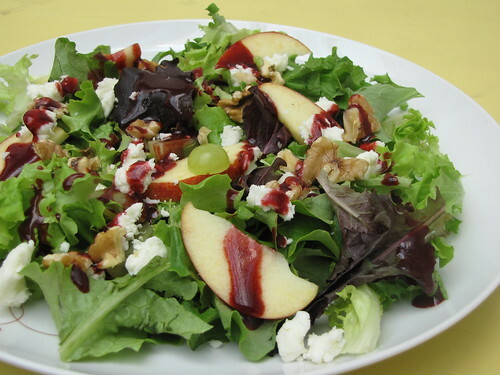 The dressing will last about a week and a half to two weeks if kept refrigerated.